Keith Scott has joined Reading on transfer deadline day in a move that will shock many Wycombe fans having heard that he had just signed a new two-year deal at Adams Park. Lawrie Sanchez told Scott of the Reading deal prior to the midweek game at Bristol Rovers and was the reason he didn't play in Wycombe's first away victory for ten months. Apparently Reading had been making enquiries for the past couple of months and must have seen enough in last Saturday's Reading/Wycombe encounter. Although the fee is not being disclosed, at least one national paper reported a �,000 deal. 31 year old Scotty was in his second spell at Wycombe having rejoined the Wanderers in the summer of 1997. He just failed to break the 100 goal barrier in a Wycombe shirt from just over 200 appearances. Sanchez has made one signing, bringing in Brentford central defender Jamie Bates on a free. 31 year old Bates had spent all his football career at Griffin Park, although long term Wycombe fans may remember that he played one loan game for The Wanderers back in September 1986 prior to making his First Team debut for Brentford. Supporters had their first chance to quiz Manager Lawrie Sanchez during a forum held in aid of former Wycombe player Matt Crossley on Thursday evening (25th March) at The Woodlands Suite, Adams Park. The event arranged jointly by the Official Supporters Association and the Matt Crosley Testimonial raised over �0 towards the fund. There is another Forum on Thursday 15th April when Alan Parry and guests (including Chairman Ivor Beeks) will field the questions that he prompted in a press release last year. More details on this nearer the date. The Club issued a statement this week that quashed rumours that the Valley Terrace might be given over to away fans for future high profile games. Prior to jetting off for a holiday in Portugal, Club Chairman Ivor Beeks said "While the Club accept there are difficulties with accomodating away fans for some of the bigger games and a number of options have been looked at - moving our own loyal supporters was never an option". Wycombe lose significant revenue when the all seated away end (Hillbottom Road) is sold out and other travelling fans cannot be accomodated in the rest of Adams Park. The capacity of the Valley End is close to 2,000, double that of the opposite end and is the only terraced area left at Adams Park. The statement went on to say "Wycombe Wanderers Football Club categorically state that the Valley Terrace will be reserved for Blues fans exclusively as it has been since the ground opened." The reserves lost there unbeaten run of seven games when went down 3-1 to Luton Town at Kenilworth Road on Wednesday (17th March) afternoon. Wycombe were 2-0 down after just 20 minutes but pulled a goal back through Martyn Lee before conceeding again. Reports have arrived that Wycombe have signed 26 year old Barnet forward Sean Devine on loan until the end of the season. Devine had been a goal-machine at Barnet since making his debut in October 1995 but has struggled to make the Barnet First Team this season. He scored on his Football League debut and went on the notch 46 goals in 106 appearances for The Bees in three seasons. Devine scored against Wycombe in the FA Cup Second Round tie in December 1996 and will see the challenge at Wycombe as the chance to prove his doubters wrong. Ex-Wimbledon youth player Richard Thompson has secured a 18 month contract at Wycombe after impressing Lawrie Sanchez in two reserve outings. Sanchez has also finalised 2½ year contracts for striker Andrew Baird and 'keeper Mark Westhead. The postponed games at Bristol Rovers and Notts County have been re-arranged for Tuesday 23rd March and Tuesday 27th April respectively. The home game with Wigan Athletic due to take place on Saturday 17th April will also have to be re-arranged if they overcome Wrexham in the two-legged Northern Final of the AutoWindscreens Shield - the final being on Sunday 18th April. There is a Real Ale Festival at The Vere Suite, Adams Park this Friday and Saturday (19th/20th March). The Festival claims to be the first ever Beer Festival in High Wycombe and has been organised by the local Rotary Club in aid of "Kids Out" 1999 and other charities. Entrance is �on the day or �in advance (including your first pint and a ploughmans meal). Serving time is 12noon to 11pm Saturday with beer costing �for a half and �a pint. There are around 25 beers on sale mainly from the local breweries such as Rebellion (Marlow) and The Chiltern Brewery plus all the 'standard' real-ales. If you're new to Real Ale this is a good way to start, although for the serious real ale buff there will be little to set the eyes rolling - still it's a start. A strong Wycombe side overcame Chesham United 4-0 at Adams Park on Monday evening (13th March) to reach the Final of the Berks and Bucks Senior Cup for the first time in eight years. Wycombe dominated from the start and should have been ahead after only five minutes - Keith Scott missing from close range after a low cross from the right by Simpson. Four minutes later Andrew Baird was denied a clear goal scoring opportunity when he was tripped in the box but Dave Carroll saw the resulting penalty saved by Pat Jennings (son of the famous Northern Ireland 'keeper). Baird was unlucky with an attempted chip after 14 minutes before Wycombe finally took the lead when Steve Brown turned in a loose ball after a meleè in the Chesham box. United's best effort came on 31 minutes when Mark Westhead brought off a spectacular point blank save from Chesham sub John Mitchell. Wycombe took a stranglehold of the game six minutes before the break - a neat run by Chris Vinnicombe down the left wing ending with a clean strike into the back of the net by Paul Emblen from a dozen yards. Wycombe scored twice within as many minutes in the second-half. First on 53 minutes when Keith Ryan headed home a Carroll corner from the right and the night's work was complete when Baird broke in from the right side of midfield to slot home. Wycombe await the winners of the Windsor/Maidenhead tie on Tuesday 30th March to decide the opponents in the Final on Monday 3rd May at The Meadow, Chesham United. Michael Forsyth played a near full game for Wycombe reserves on Wednesday evening in the game with Wimbledon at Sutton United. The game which ended goalless saw Swedish triallist Tobias Grahn sent off for two yellow card offences - both following incidents after he was brought down in the Wimbledon box - the first for violent conduct and the second for an alleged dive - incredibly the ref had to borrow a red card from the linesman in order to send Grahn off - they don't get any better! Another incident saw Paul McCarthy leave the pitch in the first half with a badly cut head after he collided with Forsyth. The reserves are now unbeaten in the six games since Lawrie Sanchez took over. The reserves take on Chesham United in the Berks and Bucks Senior Cup semi-final at Adams Park on Monday (15th March). In the other semi Garner and Co@Windsor and Eton take on Maidenhead United - the final will take place at Chesham United. There should be an official announcement soon of Andrew Baird signing a new three year contract with Wycombe. This should please Wycombe fans who feared the 20 year old may be tempted away by a bigger club. 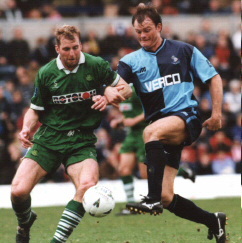 The following players are still chasing new contracts (Wycombe or otherwise): John Cornforth, Michael Forsyth, Lee Holsgrove, Paul McCarthy, Aaron Patton, Paul Read, Keith Scott, Michael Simpson and Mark Westhead - although Scott and Westhead are close to signing deals for next season. Jason Kavanagh's departure from Wycombe was confirmed on Monday (8th March) when he joined Stoke City on a free transfer. Kavanagh was out of contract at the end of the season but is another in the ever growing list of giveaways. Having joined Wycombe in December 1996 for �,000 from Derby County, Kavanagh played just over 100 games in a Wycombe shirt. There were unconfirmed reports at the weekend of Bury, Port Vale and Burnley expressing an interest in Wycombe 'keeper Martin Taylor. Taylor has one more year of his contract to run at Wycombe and is allegedly the one of highest paid players at the club. It was good news for Wycombe fans on Thursday (4th March) when Jason Cousins signed a new three year contract with Wycombe that should take his time at Adams Park to over ten years. 28 year old Cousins is the red-hot favourite to take the Player of the Season award having regained the form that won him a similar award in the 1994/95 season. Lawrie Sanchez has obviously been impressed with his never say die attitude and there are few players who are more popular at Adams Park than our very own 'Psycho'. With the news of the loss of Nicky Mohan and Mark Stallard barely 24 hours old, unconfirmed stories are coming through of the imminent departure of Jason Kavanagh to Sheffield United. 'Kavs' was another player out of contract at the end of the season and had been in and out of the side since picking up an injury back in September. Originally on loan at Wycombe from Derby County, the move became permanent in December 1996 for a �,000 fee and he went on to play 103 games - scoring just once (Blackpool away August 1997). Wycombe's Reserve side kept up their good form of late with a 1-0 victory over Brentford at Adams Park on Wednesday afternoon (3rd March) in the Combination. The winning goal came on 43 minutes from trialist Richard Thompson. Thompson is currently with Crawley Town but was part of the Youth set-up at Wimbledon. Also playing his first game in a Wycombe shirt was 19 year old Tobias Grahn who originates from Sweden. Matt Stowell played his second trial game while news has filtered in that Neville Roach has joined Southend United after just playing just one trial game for Wycombe last week. John Cornforth was injured after just five minutes. Wycombe fans were stunned on Tuesday (2nd March) when Nicky Mohan and Mark Stallard both left the club prior to the scheduled game at Bristol Rovers. The Rovers game fell victim to the weather as late as 6.00pm but it will be the latest transfer farce that will get the fans talking. Mohan has gone on a 'free' to Stoke City, while Stallard has gone to relegation rivals Notts County for a 'small fee'. Mohan had been unsettled at Wycombe since a potential move to Scunthorpe fell through last December. Mohan joined Wycombe in October 1997 from Bradford City for �,000 and made 68 appearances, scoring twice. Stallard's move to Notts County was first muted last week and is sure to hit a nerve with Wycombe fans. Stallard would have been out of contract at the end of the season having joined Wycombe in March 1997 from Bradford for �0,000. He made 78 appearances for Wycombe and scored 25 goals. Wycombe are due to play at Notts County next Tuesday (9th March).